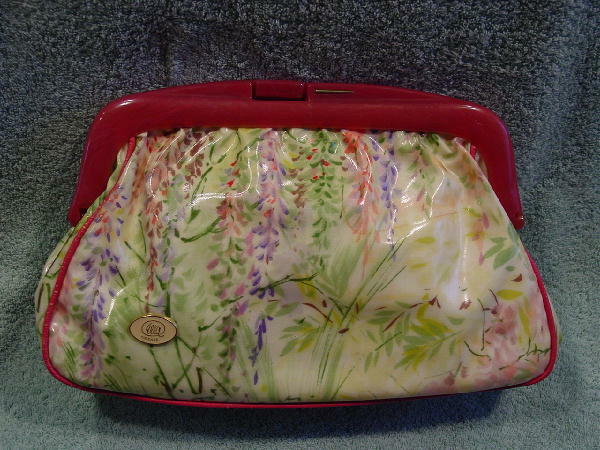 This vintage plastic clutch was made in Firenze (Florence), Italy. 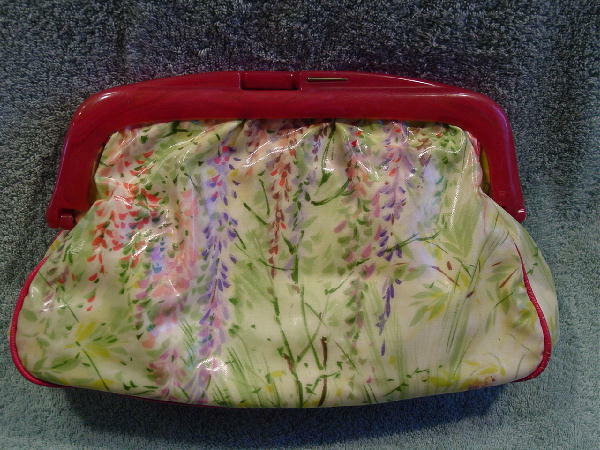 It has a lucite/plastic upper rim and closure in a raspberry-guava color. There is accent cording around the edges (with some age cracking on the cording). The exterior has a light cream background with floral designs in seafoam, icy pink, lavender, brown, yellow-green, gray, and light apricot. It has a white vinyl lining. It does have some makeup stains on the lining. There is a tiny thin strip of metal on the front and back which is actually an accent piece. On the left hand side near the bottom is an oval, gold-tone and vanilla colored metal tag which says Ella Firenze. A Miami model got it from her grandmother.